Are you tired of listening to those terrible factory speakers in your vehicle or are you looking to step up your audio game with a high-quality component speaker system? If so, our list of best 6.5 car speakers we will put an end to your dilemma. We agree that the world of car audio can seem like a convoluted mess, especially if you are new to it. However, we believe that our article will remove any confusion and help you zero in on the best set of car speakers which comply with your needs. Whether you are an audiophile or a newbie, our list of Best Car Speakers has something for everyone. Moreover, our list has car speaker systems that will fit everyone's budget. So read along to find out everything you need to know about 6.5 car speakers. ​You might also like to read our guideline of best 6x9 speakers, best 6x8 speakers for more ​information. 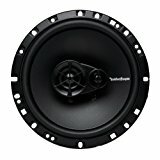 How We Chose The Best 6.5 Car Speakers? You might also like to read our guideline of best 6x9 speakers, best 6x8 speakers for more knowledge. If you thought to zero in on a single speaker was tough, imagine the work we had to put in to prepare this highly detailed list. In fact, we had quite a few challenges along the way; however, we made sure that every product in our list has been put through an extensive review first. While audio quality ranked high on our list, we gave significant importance to price, durability and product reliability as well. Although we considered other factors like ease of installation, brand image, and power output, we put less importance on these points. The main challenge, however, was to make sure our list caters to a wide range of needs. Moreover, we wanted to fit every budget as well. After reading this article, we believe that you will find your favorite set of speakers on our list. Pioneer is one of the leading brands in the car audio industry, and this product is no exception. Not only is this product well priced, but it also produces rich, high-quality audio. The following are some the features which prove why this speaker pair is one of the best sellers in the market today. The TS-A1686R speaker has an oversized cone which offers almost 14% more surface area compared to standard 6.5 speakers. This results in greater performance in the low-frequency band. In other words, this speaker has a rich bass output. The RMS rating of this speaker pair is 60 Watts while each speaker has a power of 30 Watts. The max power rating for the TS-A1686R speaker pair is 350 Watts. The design of the TS-A1686R speakers enables it to project the mid and high-frequency range audio to be projected in a uniform manner. This results in a smooth on and off-axis response. This speaker pair features large magnets which help in increasing the drivability of the diaphragm. Moreover, it ensures that the audio is not only rich but also packs a strong punch. Good performance in the mid to high frequency range. Few products offer the level of reliability that Pioneer does. Bass is not as rich as similarly priced competitors. Might be issues with placement due to the oversized cone. Pioneer has yet again delivered with its impressive speaker pair. We were especially impressed by the mid to high range frequency performance of this coaxial speaker set. Moreover, it is the brilliant value which seals the deal for us. This is surely a product which deserves such a high rank on our list. If you are looking for a reliable, high-quality speaker set which offers great value, then click the button below. Our list would not be complete without a Rockford Fosgate speaker pair. Few speakers available today offer such incredible value for money. Hence, it is no surprise that the R165X3 is one of the best 3 way 6.5 coaxial speaker in the market. This speaker set has an RMS rating of 45 Watts, while the peak power handling measures in at 90 Watts. To ensure the legitimacy of the power ratings, Rockford Fosgate speakers conform to CEA-2031 industry standards. This speaker pair with its rubber surround Vacuum Polypropylene cone structure coupled with a stamped steel basket ensures that the audio output is good across the entire low-frequency band. The Rockford Fosgate R165X3 speaker features a silk dome pole which is mounted with a Piezo tweeter and midrange that ensure rich audio performance in the mid to high-frequency range. This speaker pair comes with a set of grilles, integrated high-pass crossovers, and mounting hardware to enable easy installation. While the speaker grilles offer protection to the speaker cone, you can also use it without them for maximum audio performance. Mid to high range performance is great for the price. Rockford Fosgate offers incredible reliability and great customer support. The brand value of Rockford Fosgate. The low-frequency range performance leaves more to be desired. The build material could have been better. A lot is expected from Rockford Fosgate when it comes to car audio systems, and when you factor in the price of this speaker pair, it is safe to say that it has managed to outperform our expectations. Hence, it absolutely deserves the second spot in our list. If you are looking for a decent coaxial speaker set which offers incredible value, then click the button below. More is better right? Well, not necessarily. While most of the speakers on our list are 3-Way or 4-Way speakers, they are in no way superior to this speaker pair. In fact, the single tweeter arrangement facilitates for a much better audio experience as it obstructs less area of the speaker cone. This CS-Series speaker pair has a heavy-duty magnetic structure with Extended Voice Coil (EVC) technology which allows it to deliver brilliant audio performance, especially in the lower end of the frequency spectrum. In other words, it produces impressive bass. This speaker pair produces 600 Watts of Peak Power and each speaker outputs 300 Watts of Peak Power. The RMS rating for the speaker pair is 200 Watts. That is quite impressive for the price. The intuitive design of these speakers results in a much more compact structure compared to other car speakers. The reduced depth of the speaker enclosure means that you can fit it into any vehicle with ease. The KICKER 40CS654 speaker pair's lightweight 13mm PEI-dome tweeters have brilliant clarity, and that makes it perform quite well in the mid to high-frequency range. Moreover, the high power handling is especially impressive. High-frequency quality could be better. Mid-range performance leaves more to be desired. The KICKER brand is known for its high-quality car audio equipment, and this speaker pair keeps the trend going in the right direction. This set of speakers is not only an excellent performer across the entire audio spectrum, but it is also sufficiently loud without any sound distortion even at full volume. If you are looking for one of the best car speakers which offer great performance across the entire sound frequency spectrum, then click the button below. 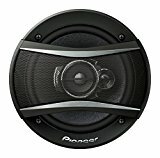 This is the second car speaker from Pioneer in our list, and we must say that it deserves a place here along with its big brother. This speaker pair not only produces good quality audio, but it is also extremely well priced. 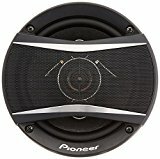 This pair of Pioneer TS-A1676R car speakers has a unique multi layer Mica Matrix cone design which makes it a lot more rigid compared to speaker cones of competitors. This reduces the internal loss and the top layer made from water-resistant material offers a higher level of protection. The RMS rating of this speaker pair is 50 Watts while each speaker has a power of 25 Watts. The max power rating for the TS-A1676R speaker pair is 320 Watts. The new and intuitive tweeter design performs very well in the mid to high-frequency audio range. Moreover, the technological improvements have made the audio quality much better for a wide range of music genre, including hip hop, alternative rock, and dubstep. The heat-resistant voice coil wire dissipates heat and is also able to withstand high input power. Thus it keeps the speaker running cool and offers protection as well. On top of that, the cooling basket with air vent increases the effect of cooling and facilitates better power handling. Remains relatively cool even after extended period of music playback. Crisp and clear audio across the high frequency spectrum. Audio playback could be a little louder. Tough to recommend over its bigger sibling, the TS-A1686R. So why would you choose this over its big brother? Well, for starters, not everyone requires the extra loudness offered by the TS-A1686R. Moreover, the difference in performance in the mid to high-frequency range can only be spotted by the most sensitive audiophiles. Hence, you can save a bit of cash by going for this speaker pair over its elder sibling. 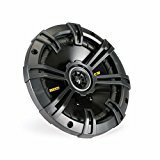 If you are looking for one of the best car speakers which offer good performance at an irresistible price, then click the button below. There is no better way to start our list other than with the stellar set of coaxial speakers from JBL. This speaker pair packs in quite a few novelties which propel it to the top of our list, as is evident from its features listed below. The patent-pending JBL Plus One woofer-cone technology means that the GTO609C speaker pair needs no extra power to increase output. This one is more efficient compared to its competitors. This speaker offers 270 Watts peak power handling, while the Power Handling (RMS) has a rating of 90 Watts at 3-ohm impedance. Moreover, these speakers use a voice coil with lower impedance compared to a generic 4-ohm speaker and that allows it to make the most out of an amplifier which is designed to drive loads of 4 ohms or less. It features an Edge-Driven, Fabric Soft Dome Tweeter to deliver incredible audio performance in the high-frequency band. Moreover, the tweeters are adjustable, allowing you to modify it to get the optimal audio performance. One of the most convenient features about this speaker pair is that it features a highly intuitive patented mounting system, which makes installation a breeze in factory locations. The GTO609C's included installation rings allow you to install it in locations which range from 6 inches to 6-3/4 inches in diameter. Decent performance in the mid to high frequency range. JBL reliability is top notch. Priced a little higher than the competition. Generic design may not appeal to all. With audio quality in mind, we believe that the JBL GTO609C is one of the closest coaxial speaker pairs to a component speaker system with a comparable power rating. While it may be priced a little on the higher side, the overall quality offered by this product is unrivaled. It absolutely deserves the top spot in our list. If you are in the market for a high-quality coaxial speaker set, then look no further and click on the button below. Although the last few products on our Best 6.5 Car Speakers list might have pointed to an increasing trend in price, we assure you that is not the case. In fact, the Pyle PL63BL car speaker pair is one of the most inexpensive products on this list. However, it is not the only redeeming quality as we will soon find out. One of the standout features of this speaker pair is the design of the woofer cone. The blue poly injection cone is surely the best-looking speaker cone in our best 6.5 car speakers list. The RMS Power Handling value is 180 Watts for the speaker pair and 90 Watts for each speaker. The Max Power output is 360 Watts for both speakers. Both the RMS and Max Power Output values are for 4-ohm impedance. The one inch Neodymium film dome midrange coupled with the 0.75 inch Piezo tweeter ensure great audio quality in the mid to high-frequency spectrum. Moreover, the performance is very smooth and without any distortions for high-frequency audio. The butyl rubber surrounding the woofer cone is extremely durable and adds rigidity to the speaker structure. This results in great audio quality in the low-frequency range. Sufficiently loud for its price. Distorts at full volume if used without a good amplifier. Not a brand that’s recognized as others. While the Pyle brand may not be as popular as the rest of the car audio brands in our list, you should not overlook it. Not only do these speakers get incredibly loud, but they also offer brilliant value for money. This speaker pair surely offers the best boom for your buck. If you are looking for one of the best speakers which are incredibly durable and offers the next level of audio performance, then click the button below. You might be wondering why the same set of speakers is on our list yet again. Well, this is the 4 speaker variant of the Rockford Fosgate R165X3 speakers we reviewed earlier. So why would you get this instead of buying 2 of the R165X3 (Pair)? Well, the 4 speaker variant offers a better deal than the former. This speaker set has an RMS rating of 90 Watts for 4 speakers and 45 Watts for the pair, while the peak power handling measures in at 180 Watts for 4 speakers and 90 Watts for the pair. Produces loud and crisp audio. A bit underwhelming build holds the item behind. This set of 4 coaxial speakers offers incredible value; in fact, it costs less than most of the car speaker pairs in our best 6.5 car speakers list. Moreover, you can spread out your speakers throughout the vehicle to offer a much more engaging audio experience. If you are looking for a set of 4 speakers which offers a great audio experience without emptying your wallet, then click the button below. This is the reason as to Boss Audio CH6530 made a cut in our list; it is a real deal when it comes to power handling and its appealing design. It is budget friendly providing a great opportunity to those who want a set good of speakers, with noble features at a fair cost. Boss Audio CH6530 features a polymer-based cone. Polymer is an affordable material yet very durable. This will ensure that this speaker will last for a lengthy period as the material will help the speaker withstand physical wear and tear while outputting decent audio. The Aluminum Voice Coil ensures that the speaker performs optimally during high temperatures or fatigue moments. This means that the speaker performance will not be halted when it is subjected to a very heavy duty play. This is due to the fact that aluminum is lightweight and can operate in high temperatures. The speaker basket is connected to the cone by rubber-based Surrounds which make it impermeable to air and other substances. The rubber also protects the speaker from wearing out as a result of exposure to different kinds of weather. The inclusion Piezo electric tweeters as opposed to traditional tweeters ensure that the high frequencies drivers are not destroyed by overloads. Their electric nature eliminates their need to have a crossover network. It is very affordable yet it produces high-quality performance. The poly cone plus the foam-upgrade improves the durability of the speaker to a great extent. Easy installation that comes with instructions guide. It a heavy duty speaker in that it can cope with many hours of playtime. High power handling (300 watts Max) which means that it can accommodate many high-power amps. It tends to grapple at high frequencies. If you are an audiophile, the audio quality may not live up to your standards. The compact Boss Audio CH6530 gives you an opportunity to enjoy a full range of sound if when you are working on a strict budget. With the easy installation process coming in handy, a set of these speakers is going to give your car a recognizable transformation. If you are looking for a set of speakers with good value, great design and good power for your car, then click on the button below. If you are a proud owner of a Jeep vehicle, Mopar has the perfect set of upgraded KICKER speakers for you. While the standard speakers on the Jeep Wrangler are not too shabby, this speaker pair from Mopar is on a whole new level. However, if you do not own a Jeep Wrangler, we suggest you move on to the next standalone KICKER product on our best 6.5 car speakers list. Although the product name suggests otherwise, you can install these speakers in almost every Jeep Vehicle including the Jeep Wrangler Unlimited, Jeep Liberty, Jeep Grand Cherokee and the Jeep Commander as well. Moreover, most models produced in the last 10 years are supported. 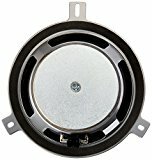 The RMS rating of this speaker pair is 75 Watts while the max power rating for the JK KICKER Speaker Upgrade by Mopar is 150 Watts. This is not only louder than the standard set of speakers in a Jeep Wrangler, but the audio quality is much better as well. There is a marked improvement in bass quality over the standard speakers available in the Jeep vehicles. This is due to the impressive cone structure of the speakers. The installation instructions guide which comes bundled with this speaker set makes it a lot simpler to fit the speakers. All you require are 3 simple tools, namely, Phillips Screwdriver, Panel Removal Tool and Pick Tool. Significant improvement over standard Jeep Speakers. Relatively an inexpensive upgrade over standard speakers. Mainly built for Jeep vehicles. Wish it was a tad bit louder. While this product may not appeal to all, it is surely a godsend for Jeep vehicle owners. We were left impressed by the rich bass quality of this speaker pair. Moreover, this speaker pair performs better in the mid to high-frequency range compared to other similarly priced products. If you are looking to upgrade your Jeep vehicle speakers with a stellar pair of car speakers, then click on the button below. Not many speakers can outperform Kenwood speakers and Kenwood KFC-169 is no exemption when it comes to their attention to details in form of clear vocals, clean lows,and stunning highs. This is the kind of a speaker that brings out the best in all genres of music especially when connected to an amplifier. Kenwood KFC-169 features a water-resistant paper cone with a special kind of radial rib design which makes the speaker stronger while delivering a more responsive bass. To strengthen the speaker further, it is reinforced with rubber surrounds improving the longevity for many years to come. This speaker has an RMS power of 75 watts and a peak power of 320 watts and an impedance of 4 ohms. The peak power output is powerful enough to match that of several combined speakers meaning that this speaker can be pushed a bit harder without clipping in or blowing out. The additional diamond array that is waterproof ensures that in case of any spillage, the speaker’s performance will not be compromised. The injected polypropylene cone ensures that the speaker delivers a clear midrange with startling midbass response. Unique in its kind, this speaker features a counter-drive magnet for magnetic shielding i.e. minimizing distortion as much as possible. The high-frequency response of 20000Hz means that the highs are clear and the response is incredible. Water resistant keeping them away from any spillages. Friendly prices and you get value for your money for the four set of speakers. Power handling capacity surpasses similar models by far. Delivers crisp and crystal clear sound. The bass is somehow weak. It needs an amplifier to perform optimally. A relatively difficult installation process. A combination of price, power and crystal-clear sound is what Kenwood KFC-169 offers giving your car a tremendous upgrade with a complete sound range like never before. If you are looking for quality and comprehensive sound, with tons of power at budget price, then click on the button below. The world of car audio is a vast one. There are many more choices of car speakers than there are for cars. Hence, choosing the right set of speakers can be an arduous task indeed. Even with our list of best 6.5 car speakers, zeroing in on the right one can prove to be quite a hassle. However, there is no need to worry. With the help of the following factors, we will help you lock down on the speaker pair which is best-suited to your needs. Before we debate which of these speakers is better, let us understand what is meant by the above terms. A coaxial speaker consists of a single speaker enclosure which includes the woofer, tweeter, along with the crossover. On the other hand, component systems implement these three components separately. Now, there are obvious advantages and disadvantages to both setups. In the case of component speakers, you can expect a much higher audio quality compared to a coaxial speaker with similar power output. However, the higher audio quality comes at a premium. Moreover, it is a little tricky to install the separate parts of a component speaker system. Therefore, if you are a true audiophile with deep pockets, then the component system makes more sense. For every other person out there, you should stick to coaxial speaker systems. While the audio quality may not be as good as a component system, it should suffice for most. Do not get swayed by power ratings of speakers without understanding the difference between Root Mean Square (RMS) Power Output and the Peak Power Output. Many audio brands only advertise the Peak or Max Power rating of their speakers without showing the RMS value. Simply put, it is the RMS rating which determines the actual loudness of a speaker. The RMS value indicates how much continuous power the speaker can handle without sustaining damage. On the other hand, the Peak Power rating determines the maximum power it can handle in short bursts without blowing out. Hence, it is clear that you should only compare RMS values if loudness is one of the defining criteria for you. Moreover, be sure to check whether the RMS value advertised by the company complies with the CEA-2006 and CEA-2031 standards. While most car speakers have a generic design, some speaker pairs like the Pyle PL63BL and the Polk Audio MM651UM we featured earlier in our list, stray from that trend. If the speaker design is not important for you, then you should focus on the depth of the speaker enclosures to ensure that they fit inside your vehicle. You can now check whether it is possible to install the speaker of your choice inside your vehicle using an intuitive tool on Amazon.com. If you are looking to install car speakers in your ATV or a similar off-road vehicle, then you should pay close attention to the Marine Certification. The Polk Audio MM651UM we featured earlier in our list is a solid example of highly durable speakers. We know that choosing the right set of speakers can be quite confusing, especially if you are new to the market of car audio. However, we put a lot of thought and research into our article to help you come to a conclusion. In fact, we strongly believe that our best 6.5 car speakers list, coupled with the buying guide is all you need to purchase your brand new set of car speakers. Before we part ways, let us remind you a couple of important things you must focus on before you head out to purchase a new pair of car speakers. Do remember to pay extra attention to the RMS power rating and the CEA certifications, especially if you plan on using a separate amplifier. Moreover, if you are buying from a lesser known brand, do read the warranty information properly. With that, we bring our article to an end. We hope you enjoyed reading it as much as we enjoyed reviewing the products.